Not to be confused with my recent 50 point battles against Mitch’s Chaos models, I played yet another smallish game against the forces of Darkness. In this instance, I wound up playing against Albert, who fielded a bunch of Nurgle units instead of Khorne, so I got to see how other things functioned. It was his first game of 8th, so we went through things as slow and methodically as possible. Technically, it was also a 50 point game, but he didn’t have the right models with him to field exactly that many, so I let him squirt over the top a little. No surprise, Albert threw down a bunch of Nurgle demons on the table–pretty much one of every available option (short of Scabeithrax–thank god). The question marks by the Beasts isn’t because I’m unsure of whether he had them or not, but rather because I’m not quite certain if they’re elites or fast attack. Probably the latter, but I’m throwing them into the fast attack slot for this battle report. 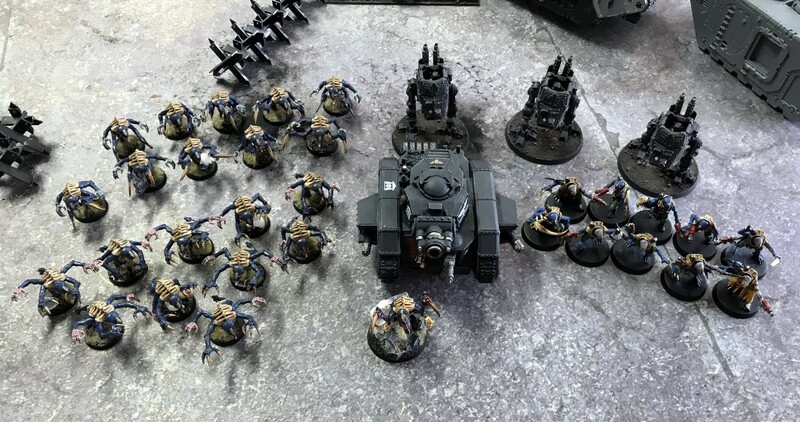 My genestealer cult still suffer from the same list building restrictions as they did in 7th edition: namely that I haven’t painted up any characters still, so I’m forced to lean on my Tyranid units for that. I also haven’t painted up any heavy weapons, or vehicles (though the latter works because I have a bunch of pre-painted tanks laying around. I’m pretty convinced that MSU (multiple small units) is still the way to go in this edition. Sure, it means that I basically never get first turn (which isn’t really something you particularly want with an assault based army), but there are numerous advantages with smaller units. To test the theory, I figured I’d run my squads bigger this game. Baby Making Time – The Cult Must Survive! 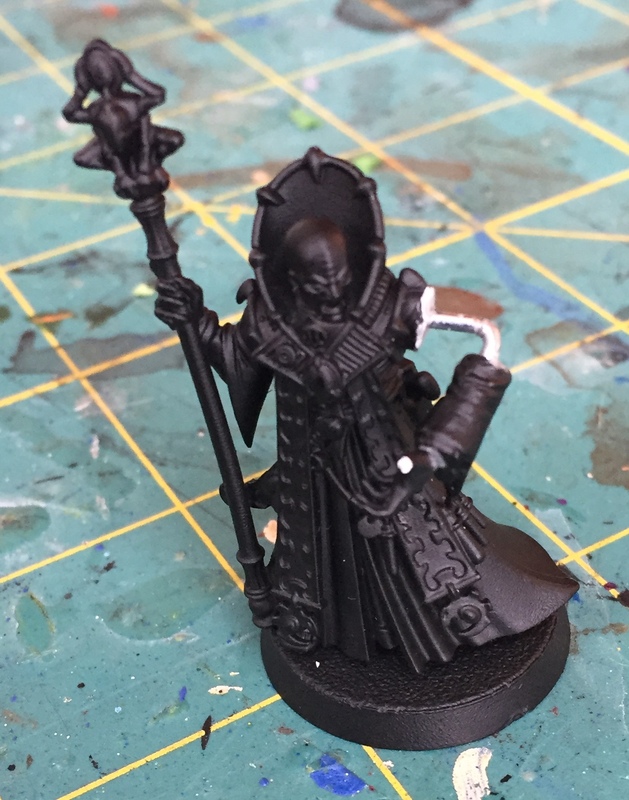 When I set to making a cult Magus with a little friend, I knew that I was inspired by another model I’d seen online somewhere, but when I turned to a Google search, I wasn’t able to locate it. If you wind up searching for yourself, you’ll likely see that any combination of the search terms “Genestealer,” “Cult,” “Magus,” & “Baby” come up with no relevant hits. Well, that’s not to say that they’re not relevant at all, but that you just don’t see anything resembling a cultist with a baby in it’s arms. You’ll, of course, see a bunch of hits for various cult magi from around the net, but likely nothing immediately relevant. At one point, that left me to wonder if I had made it all up. 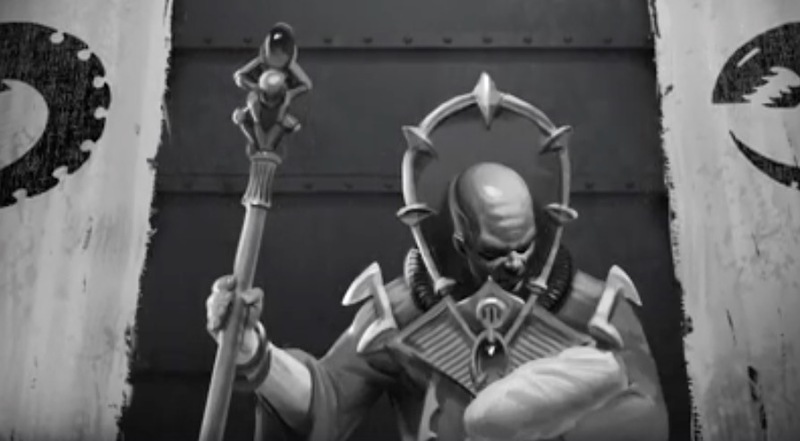 Maybe I was just envisioning a model based upon the GW artwork so vividly that my mind had tricked me that it really did exist? While anything is possible, my imagination just isn’t that impressive. Luckily, I wound up saving the artwork on my home PC in an “inspiration folder” (which is a folder where I save various pictures of ideas that I want to steal from other people), so with a google image search, I was able to determine that I hadn’t made it up. The reason why Google is likely not providing me with the results that I want is because the artist who worked up this little baby is French, as is, naturally, his blog. 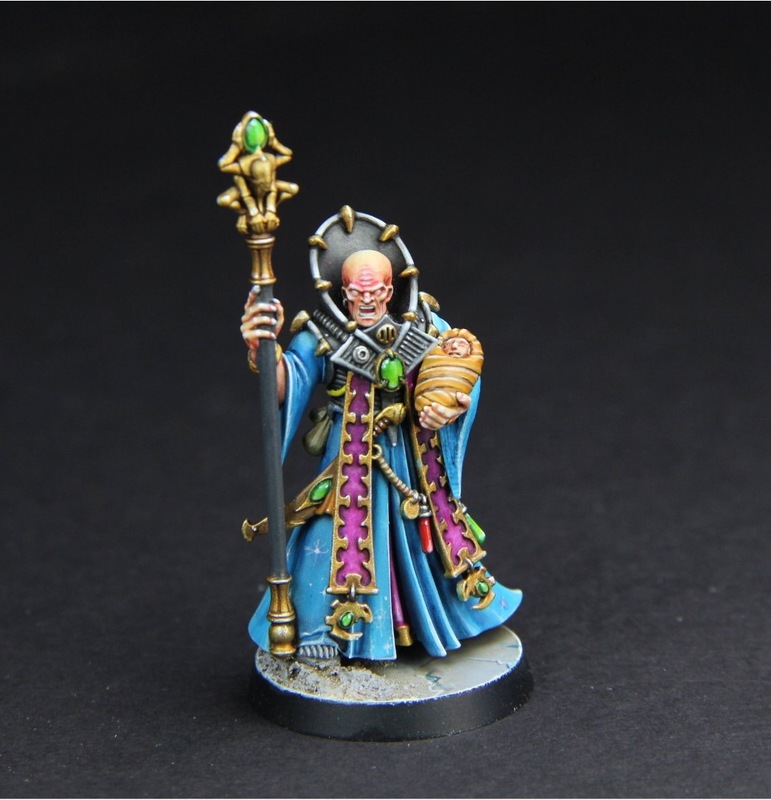 So, instead of looking for a Genestealer Cult Magus with a baby in his arms, I would have had to search for “d’un magos de Culte Genestealer tenant un bébé dans un bras.” His conversion is really quite simple, but he pulled it off well, and it’s not hurt by his fantastic paint job. 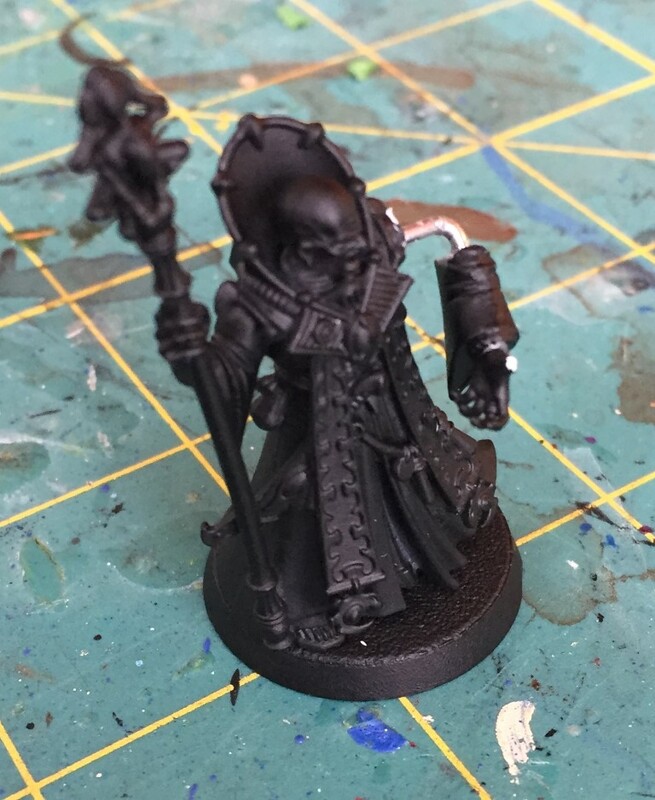 The image of the painted figure in this blog post is of his model. If you want to see more of this particular figure, or of his cult in general, I would encourage you to check out his blog–in particular, this post. I wound up starting on the conversion from memory though, knowing that it basically involved an arm swap and a custom baby. I started at first by looking for baby models online, because I had forgotten how he did his (though, now that I see, I’m going to steal that idea, though I will likely mix it up a bit). On the arm though, he seems to have kept the upper arm in place and crafted a new sleeve. I wound up going a different route here: I chopped off the arm at the shoulder (or at least as close to it as I could reasonably come without messing up the robes, and then measured out the arm length in a paper clip to determine where the elbow should be. I scored the paperclip to show me where to bend it and then set to it with some pliers. The end result is that the bend is not actually in the right spot, and his upper arm as a result will be too long; however, I think that I’m going to leave it as is, so that he can comfortably cradle a larger baby inside it. This is pretty great. I somehow turned cutting off an arm and inserting a bent paperclip into it into an entire post! Using that as a guide, I shouldn’t have to do any more projects except for this guy and I should have plenty of content for my blog for the next six months! It’s Time to Make a Baby! When Deathwatch: Overkill was released, I went ahead and purchased three copies of the game–or rather, I purchased one copy and then two extra sets of the cult models from the box. 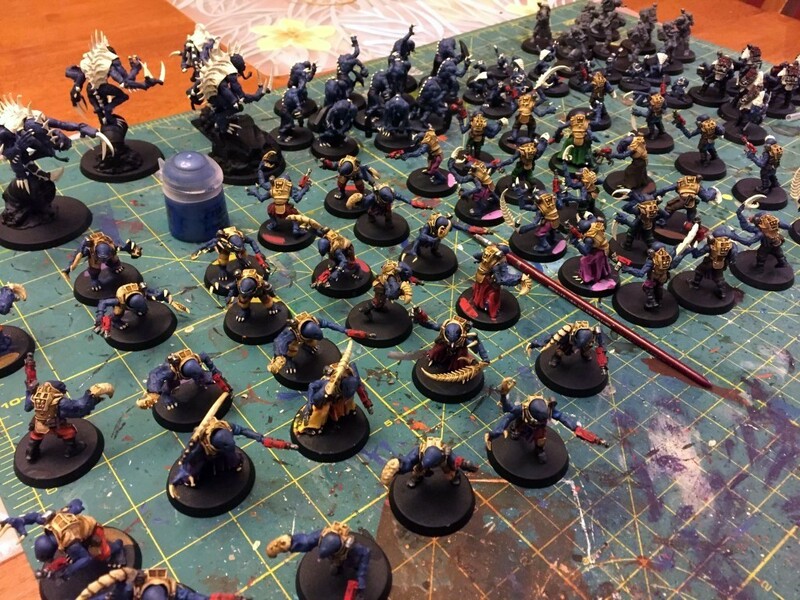 I knew that it was “overkill,”–especially because they had no rules in 40k and, when they finally released them, they were designed so you really could never use more than one box of them. So, I didn’t get around to painting them until fairly recently. This post is about one of those magi. At one point, I assembled most of my models and took them on a trip with me so I could paint them in my free time. Painting progress on that trip was minimal at best, and it turns out that when you just throw a bunch of models into a tub and pack them in a suitcase, you’re liable to have some breakage. One of my Magi suffered and irreparable tear to his phalange and, as such, can no longer grasp things without an opposable thumb. Maybe I could green stuff a thumb on him, though I feel that sort of thing would be likely to fall off again. But then it hit me, why not model up a baby in his arm, and use that baby to cover his thumb? The idea of him holding an infant just creeps me out, and was inspired by a drawing in the new codex. Unfortunately, my green stuff skills aren’t terribly keen, so it’s going to take a bit of effort and a whole lot of luck. Then again, I have five more models, so it’s not a big loss if I mess him up, right? Wish me luck! I haven’t gotten many games in this year. Ok, that statement has a superfluous “M” in it. It should ready: I haven’t gotten any games in this year. We’ve been pretty regular as a gaming group, but most of the time we’ve been playing board games. In particular, we’re playing campaigns of Star Wars Imperial Assault and of Silver Tower. So, basically when the guys show up in any quantity, we generally play those instead of 40k. That’s fine, but I do have to get my 12 games in per year, and I’ve been making a lot of progress on my cult, so I wanted to dust them off. Actually, I was supposed to get two games in this particular day, as I had the day off and had scheduled another game in advance–but things didn’t work out and my first game had to cancel due to illness. But at least I got this one in, right? Mitch doesn’t have a great win/loss record, so this list is clearly too powerful to play against him. I knew that going into it. I justified it because I have all of these newly painted models that I’m itching to have see the table and because he did say that his list was pretty powerful. 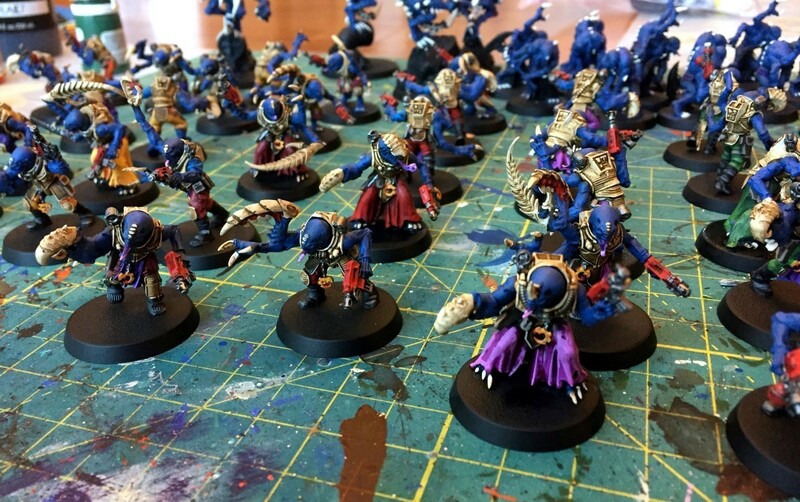 I also justified it by leaving about 60 unused points on my list (because that wasn’t enough to throw another squad of genestealers in, so I had no idea what I’d do to fill those points). 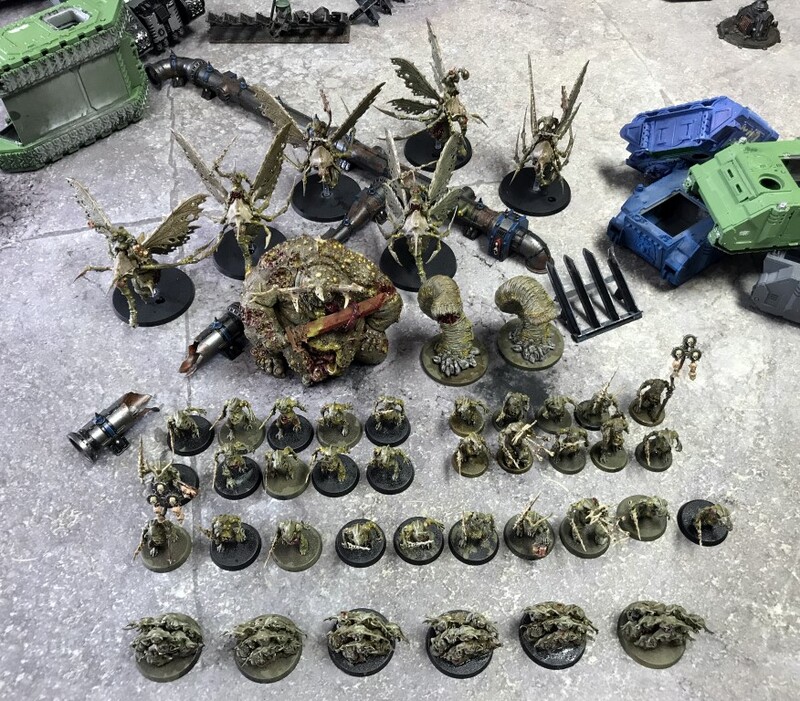 This is really just an evolution of the only other game I played with my cult, wherein I used nothing but the required minimums and some patriarchs (cheating) and as many genestealers as I could squeeze in the list. Technically speaking, they aren’t based, so they have a ways to go, but the painting process on these guys is essentially complete (I say that while completely ignoring the fact that basing generally involves gluing little bits and other gubbinz which, of course, need to painted). But I won’t be working on basing until sometime in the Summer when I can work outside and keep the static grass from completely destroying my house. I was initially very happy with myself because I essentially managed to paint all fifty of these guys over a three-day weekend. From looking at the photos, the blending from dark to light on highlights clearly suffered as a result. I accept this knowing how fast I painted them and how cheap they are to field. I’m not sure it’s fair to justify these as inconsequential paint jobs because they’re merely 11 points a piece when I spend a good deal more time on a tactical marine that costs 14-15. Granted, I could go back and work on these–especially the highlights on their leather, but I think anyone who sees them would have a hard time not calling these table top quality. From afar, I dare say they look pretty darn good. I still need to go back and take final quality pictures of them, but those really don’t need to happen until I get around to actually basing them. So, again, we’re going to wait until Summer to do that. Hopefully by that time I’ve finished all of the remaining models for my cult and Nids and can dip them “one last time” (again) and then get back around to taking another army photograph. When I do that, I can also go through the effort to take shots for each individual squad as well. But that’s still months away. For now, I’ll call these guys “done” and move on to my next project… most likely characters for my cult. This web site is completely unofficial and in no way endorsed by Games Workshop Limited. Adeptus Astartes, Blood Angels, Bloodquest, Cadian, Catachan, the Chaos devices, Cityfight, the Chaos logo, Citadel, Citadel Device, Codex, Daemonhunters, Dark Angels, Dark Eldar, 'Eavy Metal, Eldar, Eldar symbol devices, Eye of Terror, Fire Warrior, Forge World, Games Workshop, Games Workshop logo, Genestealer, Golden Demon, Gorkamorka, Great Unclean One, Inquisitor, the Inquisitor logo, the Inquisitor device, Inquisitor:Conspiracies, Keeper of Secrets, Khorne, Kroot, Lord of Change, Necron, Nurgle, Ork, Ork skull devices, Sisters of Battle, Slaanesh, Space Hulk, Space Marine, Space Marine chapters, Space Marine chapter logos, Tau, the Tau caste designations, Tyranid, Tyrannid, Tzeentch, Ultramarines, Warhammer, Warhammer 40k Device, White Dwarf, the White Dwarf logo, and all associated marks, names, races, race insignia, characters, vehicles, locations, units, illustrations and images from the Warhammer 40,000 universe are either ®, TM and/or © Copyright Games Workshop Ltd 2000-2010, variably registered in the UK and other countries around the world. Used without permission. No challenge to their status intended. All Rights Reserved to their respective owners.